The Bull Runner Unilab Active Health Dream Marathon is not just about letting first-time or second-time marathoners achieve their marathon dream. It is also about experienced marathoners being given the opportunity to give back to the running community, to give new runners the same support and motivation they received from others. To basically pay it forward. If you are NOT a participant of TBR ULAH Dream Marathon, but you want to be a part of it. This is the way. You can sign up as a DREAM CHASER. We will open only 60 slots for Dream Chasers. Acceptance will be on a first come first served basis, but priority will be given to runners who have provided support for TBR Dream Marathon during our Bull Circles, Bull Sessions, or past races. The slots fill quickly (just like the race) so do sign up as soon as you can. If you’re interested, please read the details below and find the sign up sheet at the bottom of this post. From the assigned Station to the next, run with a random group of DM participants or a particular participant with an apparent need to be paced. Run should be a maximum of 3k only. If you are interested in applying as Dream Chaser, please click on the link below. You will be notified via email or text if you are accepted. The final list of Dream Chasers will be posted on tbrdream.com before the end of January 2014. The Unilab Active Health Camp Alpha triathlon weekend is happening this January 25-26 at The Village Sports Club, BF Homes, Paranaque and February 8-9 at Sandari Batulao, Batangas! Presented by Specialized, this training camp will have technical swim sessions led by Coach Martin Carandang, and advanced lectures on training with Pace, Power, and Heart Rate by Coach Andy Leuterio. With their proximity to excellent riding and running routes as well, the Unilab Active Health Camp Alpha will also have epic training sessions designed to help the Age Grouper make 2014 a Breakthrough Year! The Unilab Active Health Camp Alpha is OPEN TO ALL TRIATHLETES. More volume-focused training with plenty of hills and scenic roads, an ideal tune-up for upcoming Standard and 70.3 races. Unilab Active Health Camp Alpha is also a “tri-out” series for athletes who would like to apply for the 2014 Alpha Training Systems “Red” and “Black” programs. The “Red” program is ideal for the athlete who would like to finish races strong, but on limited training time, while the “Black” program is for the athlete who would like to go all-in this year with a highly customized and variable program. There will only be 10 slots to the “Black” program in 2014. Participants who would just like to have an awesome training weekend with like-minded folks can opt for either Leg, but applicants to the “Black” program must sign up for both Legs to be eligible for “Selection”. Download and fill-out the Registration Form (Encircle or Highlight which Leg(s) you are joining). Remember One Run? The run we organized a week after Typhoon Yolanda struck our country? All of you runners who participated helped us to raise P615,000 in cash and quite a large number of in kind donations. Majority of the funds were donated to Javiertown while P100,000 was donated to New Tribes Missions through Philip Leroux and Hector Yuzon of Secondwind Running Store. I am still amazed of how organized and structured New Tribes Missions is. What is happening now from an operational standpoint: they made the island of Cuyo their base of operations as this is one of the bigger islands that has an air strip and electricity. Cuyo is an hour and five mins away from Puerto Princesa via a Kodiak plane, which is a 6 – 10 seater propeller powered plane. This was sent in by New Tribes Indonesia to specifically help the typhoon victims in Philip’s area. And for the past 4 weeks, they have maximize everyday their 2 planes to haul supplies and relief from Manila to Puerto to Cuyo. And from Cuyo, the 2 choppers distribute the goods to the 6 islands which are under the municipality of Agutaya. The guy (far left) is from New Tribes Aviation Head Office. He is the overall Pilot chief for their group, and here he is on Cuyo manually refueling the helicopter to continue with relief operations. Their group is so organized with highly trained experts from different countries. Even though the group is lean staffed and so diverse that I am the only brown man that day flying in and out with them :D, their group is so amazing, that they even flew in a third party group to continuously do daily computation of the goods and personnel being loaded per flight so they know if they are maximizing each trip or if they are overloading the planes so as not to waste fuel and of course, monitor the goods being shipped out. Philip (New Tribes Agutaya) with Donovan (from New Tribes way up north of Luzon), who came down just to help with the relief operations. Here’s how its done: basically they all move within only Philip’s instructions and area of responsibility; (with coordination with the mayor of Agutaya) anything that needs to be done outside should be first cleared with him. Everything and everyone is being inspected by Philip himself. From the moment where the packs and goods are sorted in Manila, to where the goods are further divided on a family level – he inspects for himself if each family got what they should. What this means from an operational standpoint is, that this eliminates error in calculation, redundancy in work and non-essential personnel. What would normally take a day’s worth of trip or even a week’s trip (depending on water conditions for the small pump or fish boats) – only took a half a day to reach 4 of the 6 islands. Agutaya – check how good the pilots of New Tribes are, we landed on a pier!!! Basacar – locals are giving our pilot, Brian sea shells, which according to Philip is a huge gesture, almost like celebrity status! Some of the residents have started rebuilding their homes and boats, gathering spare wood and whatever materials that may be still lying around –materials for reconstruction are still needed. Their main source of livelihood is seaweed, this is actually a primary ingredient for all things plastic, specifically for plastic tables and chairs. And as I am writing you now, New Tribes is now transitioning into giving them raw materials for their homes, boats and livelihood so as they can now move forward from the typhoon and slowly have a sense of normalcy in their lives. I already told Philip this, and I just want to share with you – as I was collecting the first shipment of relief for Philip, I was just overwhelmed with a feeling of joy and sense of purpose, that I was suddenly wiping tears from my face as I was driving from one shop to another. Simply put, I was just so happy and lucky to be able to do this small thing for the people of Agutaya, whom have lost so much. I was just so happy knowing that all our efforts will directly reach and be felt by those who are in need. I was only able to visit 4 of the 6 islands, and man oh man – both Philip and I were knocked out on our trip back to Puerto. Loading and unloading the goods, flying in and out of islands, and talking to everyone just really takes a lot from you – it felt like a marathon. Really. Everyone in the islands that we went to said that, if it hadn’t been for New Tribes and the aid they got from Manila and all over the world – they would have starved, and continued with nothing. Anarchy, starvation and chaos which we heard from the news that happened in Tacloban and Leyte was all avoided here. With One Run being the biggest contributor – I wanted you to feel how tight the handshakes I got were, and how their look was full of joy just to meet one of the people who gave them aid, even if it was just little. It was really humbling, and puts how small all our problems are compared to what they went through and are still facing. I am so thankful that I was able to help, thankful that I know Philip – someone on the ground who we could trust to oversee everything and make sure the relief reached those who are in need. Thank God for New Tribes. Thank God for everyone who helped. Hector Yuzon is the owner of Secondwind Running Store. He is a runner and triathlete who is currently enjoying the trails whether on foot or on his bike. Happy New Year to my dearest Dream Marathoners! Hope you enjoyed the holidays with your loved ones. I hope you also had a grand time running those long runs during the long break. We have 7 more weeks to go until the big day so it’s time we get back to business! As you know already, all TBR ULAH Dream Marathon participants are required to submit a medical certificate from a licensed physician to certify that you are fit to participate in the marathon. This is for your own safety and this was announced in your Welcome Kit. The medical certificate must be dated from JANUARY 1 TO FEBRUARY 6, 2014. This means you can start getting your medical certificate from your doctors already. To download a sample of the medical certificate, click on this LINK. A medical certificate in a different format from the TBRDM standard will still be accepted. Medical certificates will be collected upon claiming of your RACE KIT during the Send Off Party on February 6, 2014, Thursday at Unilab Bayanihan Center, Brgy. Kapitolyo, Pasig City. The event starts at 7:00PM, but Race Kit redemption will open starting 6:00PM and will end at 9:00PM. NO MEDICAL CERTIFICATE, NO RACE KIT. We will not accept any medical certificate submissions prior to the Send Off Party. We are pleased to inform you that Hi-Precision Diagnostics, our official laboratory partner, is offering a special package for TBR ULAH Dream Marathoners. This package is optional for participants. The package was recommended by Hi-Precision’s In-House Doctor, Dra. Lalaine Macatangay who suggests the tests below to ensure that your body is fit for long distance running or any high endurance sport. Included in the package is the medical certificate for the marathon, which we require for participation in the marathon. Total savings amounts to P750. Runners who avail of the package must present their TBR ULAH Dream Card. Package is non-transferable and not convertible to cash. Offer expires on February 6, 2014. 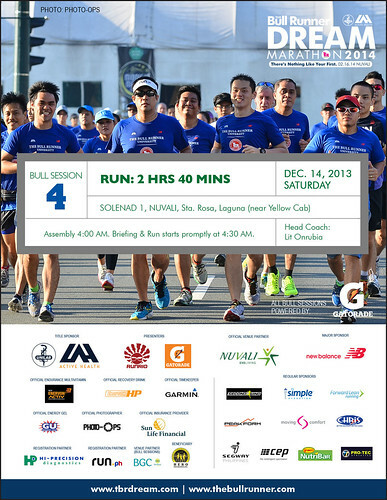 It’s our 4th Bull Session for TBR Dreamers 2014 on Saturday, December 14, 2013 at our race venue, NUVALI, Sta. Rosa, Laguna! Venue: Solenad Activity Area, NUVALI, Sta. Rosa, Laguna. (Near Yellow Cab) Click HERE for location map. Thank you to our official venue partner NUVALI for providing free shuttle service for a limited number of participants for our Bull Session. 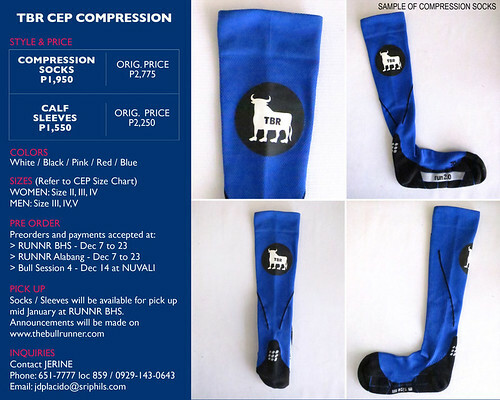 CEP staff will be onsite at Bull Session 4 to accept pre-orders and payments of TBR CEP Compression Socks or Calf Sleeves.